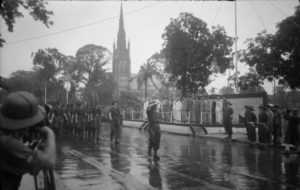 By June 1945, the Japanese army had pulled out of Rangoon. This week in the war, on 15 June 1945, Lord Louis Mountbatten held a victory parade in the city. Rangoon—where Aung San Suu Kyi, the current head of state for Myanmar (Burma), has her home—had been occupied by the Japanese since 8 March 1942. Fighting continued in Burma well into July, with the Japanese suffering heavy losses in their attempts to withdraw their armies. This entry was posted in World War II and tagged Burma, Mountbatten, Myanmar, Rangoon. Bookmark the permalink.